MapClipper is a web tool for clipping Google Maps into Evernote. When you would like to save one address into your Evernote, besides typing plain text, you could insert one Google Maps image for that location with the help of MapClipper. Input the new note name or choose an existing note. That is it! You can also adjust the position marker in the map, and each map image in the note contains a link back to the location in Google Maps. can anyone give me some feedback? whether this tool is useful or not? or some improvements you want to see? Thanks a lot. Although i had some trouble registering the app to Evernote. This might have been an evernote problem though. After re-registering again, it worked fine. I also see the usefulness as you can click the link/map in Evernote again, and its opening google maps again. This also works on my moble (android) phone. The one thing missing, was putting it in a Notebook directly. You can now make a new note or link it to any of 5 last used notes. thanks a lot, Roord. I only tested MapClipper in Chrome, Firefox and Safari browsers. Do you mean you want to save the map into one new note directly with just clicking one button like Amazon 1-Click? It would be cool to add the GPS coordinates as the note's location, too, in order to view the note in the Evernote Atlas, as well. this is an IOS app? It'd be nice if it could open in your area by default. Thanks André. I clip several map images into one note sometimes, so for this case I do not know which lat/lng of those map images I should use to set note's location. How about setting note's location with the last lat/lng of the clipped map image? Well, I don't know how you can clip multiple locations at once and how to get the coordinates for a location. How would you do that? Anyway, I think that it would be very handy to add the location automatically. In case you have more than one, use at least the first one, I would say. Am I missing something really simple? I approved the mapclipper on evernote, but is there an icon to launch. I did not see one, and went back to mapclipper web site. where in order to save a map, I had to re authorize the use of mapclipper? seems redundant. How can it be launched withing evernote? I can only clip one location image into one note each time, but if you choose an existing note for saving, that map image will be append to the end of that note. Google Maps provide some APIs to get the lat/lng of the clipped map center and location(marker in Google Maps). I will think about setting the notes lat/lng with location in the first map image. Thanks. Hi Iceman, if you approved MapClipper on Evernote, it should redirect you back to mapclipper.com in browser and then you can save one map image into your note without authorization. But if you use another browser, it will require you to authorize MapClipper again. As far as I know you can not launch any third-party Apps within Evernote. Evernote provides the App center page to launch each approved web app. MapClipper is not approved yet as I just sent the application several days ago. By the way I will add the app icon for MapClipper later. Thanks. If you save a map to a note, or even two maps, you can put your mouse over the saved mapped, and the lat and long will show up at the bottom bar of the note. It will show the lat and long of where you have the pin set on the map. If you open the note up on an Android phone, select the map with your finger that you want to know the lat and long, then select view, then select details, it will show you the lat and long of the pin on that map. I also found that opening mapclipper.com up on the note3 with chrome that the black area of the mapclipper takes up 90 percent of the window, if you turn it on it's side the black area will only take up about 50 percent. I do some research and fixing locations on a GPS units for a transportation company, and it would be nice to use this to clip maps at locations and follow up later on my Android. Thanks capken, that would be really useful! 1. Show the default map based on your location. 2. Set the note location based on the lat/lng of the clipped map center. I also fixed one bug when clipping a map into an existing note. Thanks. address the issue of including maps in notes. google and would like to have this map show up in the body of a note. I found this tool to be very useful. The only thing I would love to see would be some way to include directions from one location to another (unless I'm just not seeing the option). Thanks! I am planning a trip right now and your MapClipper is great for this purpose. A Route tool would be great. At this point, just laying out the most direct route from Point A to Point B with a colored line would be a fantastic addition. With GPS in my iPad, having a map in Evernote for navigation is mute. However, once in Evernote, I can Skitch the map all I want to show the Route line for the record/teaching purposes that I have. This is a great tool! Automatically geotagging the note to match the clipped map is a great improvement. I think the main improvement I would suggest now would be giving users the opportunity to select which notebook the note gets clipped into. As it is, every time I clip a map I have to go search through it in my notes and add it to the correct notebook. Just saw Mapclipper nominated in the Evernote awards. However, it doesn't seem to work for me. Unable to save a location. Is there a problem? This is a very useful program, thank you so much. Could this be made into Chrome Extension? first of all, great additon to evernote! Congratulations for this "addon". I found an issue that you might not be aware of. When a notebook is shared with others users, even if they have edit permission, the last edited notes don't appear on mapclipper so they can't add the map to an existing note. Is this a bug? Hi Hugo, Sorry to reply you so late. I want to know more details: are you using the enterprise type Evernote account? When others edit your shared note, can you see that note is listed at top(sorted by updated date) in your account? I am thinking that when I search for a location, I can clip it to a particular note. Yes, i have an Enterprise account. I can give permissions for others to see or edit notes I've created. After a user with edit permission, changes one of my notes, that note is listed at the top in my account, but that note does not appear listed in mapclipper for the user. To make that note appear for the user, he has to move that note into a local notebook first. Only then, that note appears listed in mapclipper. After that, he moves the note again to the shared Notebook. This only happens with notes created by someone else. For instance, if you create a note and place it inside a shared notebook created by me, you won't be able to add a map using mapclipper because that note will never be listed. If you want I can setup a shared notebook for you to test. Send me a private msg with your Evernote e-mail. Hi, just find out this cool tool I will be using at work for sure. I was wondering if it could be possible to make the image clipped , once in evernote, be displayed in different ways not just as an image or at least it would be nice to adjust it size. I think it would be great to have just a link that redirect you to google maps. I am working very often with google maps timeline and it would be great if it would be possible to save a day of this timeline to Evernote. 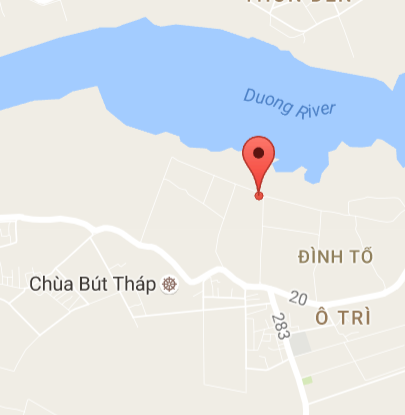 In Google Maps, I found a pagoda in Vietnam by searching "but thap pagoda, vietnam". But MapClipper couldn't find the pagoda. When I used Vietnamese: "chùa bùt tháp, việt nam" MapClipper found the pagoda. So, the search function in MapClipper seems to work different from Google Maps. The pagoda was successfully clipped to Evernote, including the co-ordinates and the name of the location. However, when I clicked on the geotag, Google Maps showed a location 500 m apart from the pagoda. You can see it in the attachment. When I save the pagoda in Google Maps on my laptop, I can send it to my smartphone. When I open the pagoda on my smartphone, it shows at exactly the right position. So, Google knows the exact location. For some reason the location differs after clipping Google maps. Sending the maps to Evernote is great for planning and documentation. I would like to transfer the co-ordinates to my gps for navigation so I need the exact location. I hope you can have a look at this. Anyway, MapClipper is a very useful tool.